The Christian Feast of the Annunciation takes place on 25 March of every year. It celebrates the day when the Virgin Mary learned that she had immaculately conceived Jesus. Beginning in 1155, 25 March was celebrated as the start of the new year in England. To the Tudors, the holiday was called, “Lady Day.” Lady Day was exactly nine months before Christmas on 25 December, the birthday of Christ. How did Lady Day come to mark the beginning of the legal year? Lady Day was the first of four quarterly dates in the English calendar. On these quarterly dates, school terms would begin and servants would start work. More traditional schools still observe start dates on quarter days, such as Michaelmas term, beginning on 29 September. In order, the quarter days are Lady Day on 25 March, Midsummer Day on 24 June, Michaelmas Day on 29 September, and Christmas Day on 25 December. New Year’s Day, 1 January, was traditionally viewed as the day of Christ’s circumcision. It was included in the Twelve Days of Christmas, and was the day for gift-giving. Being set in the dead of winter, not many economic activities could take place. The days were shorter, and though work could be tended to via candlelight, it was made more difficult. Agricultural activity was over for the year or had greatly wound down. By contrast, Lady Day was a way of marking when the agricultural season started and when monies were due to be paid. There are several notations in Henry VIII’s accounts of monies being paid or coming due on 25 March each year. Farmers and their families who worked different lands would travel to their new plot so that they could begin work on Lady Day. Lady Day is the quarter day closest to the vernal equinox, when there is the same amount of daylight as darkness. Customary in Henry VIII’s times, Lady Day would also mark when a person’s appointment to office would begin. Of note, the British personal tax day beginning 6 April is a leftover relic of Lady Day. Once the new calendar was adopted and the difference of days adjust for, it was found that the day previously known to be 25 March was in fact 6 April. A more important holy day occurred a month later, on 25 April. This Major Rogation day was a religious holiday, observed in fasting and prayer. It was a time to ask for forgiveness of last year’s sins, and to ask for benevolence in the coming year. There were religious processions during the time of Henry VIII. Changes were put in place to address the issue, and there was a prolonged observance of the Major Rogation. Some of the ordinances enacted took effect on 4 April 1543, which was Easter Sunday. Holinshed continued, “It was also enacted, that from the feast of Easter then next issuing, neither Mayor nor his brethren should buy any crane, swan, or bustard, upon pain to forfeit every fowl by them so bought, twenty shillings….” Though still large quantities of food, these laws show how dire the situation in England was becoming. Believing that the country was being punished by God, the necessity of everyone properly and devoutly observing the Major Rogation and Lent was of even more importance than usual. Lady Day, with its charming name, was not a celebrated holiday. Instead it was strictly legal, with some very rare exceptions. 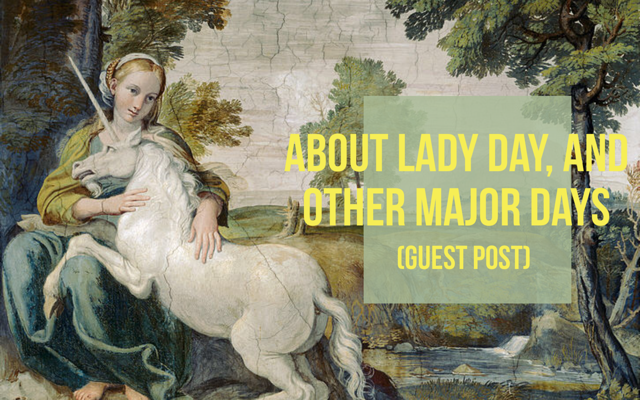 The Major Rogation was more important and was not observed until a month after Lady Day. ** Remember, Lady Day, 25 March, was the legal beginning of the year. Thus, the court of aldermen took place in 1543 in the modern calendar. 1. Holinshed, Raphael. Holinshed’s Chronicles of England, Scotland, and Ireland. Vol. III. Pg. 831. London: J. Johnson, et al. (1808). 2. Eds. Gairdner, James and Brodie, R. H. Letters and Papers, Foreign and Domestic, Henry VIII. January to July 1543. Vol. 18, Part 1. Book of Augmentations, No. 117b. , 1224b. 3. Catholic Encyclopedia, General Chronology. http://www.newadvent.org/cathen/03738a.htm#beginning Accessed 20 March 2018. 4. The Conversation. “Why the UK Tax Year Begins on April 6 (it’s a very Strange Tale).” http://theconversation.com/why-the-uk-tax-year-begins-on-april-6-its-a-very-strange-tale-57247 Accessed 21 March 2018.